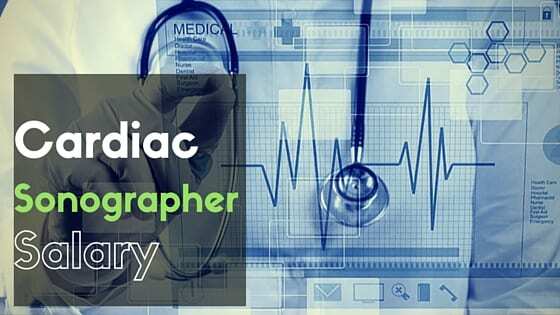 Cardiac Sonographer Salary average salary according to Indeed is $82,000 per annum, while starting earnings in New York area is $80,670 – $121,005 and top professionals earn $115,243 – $172,865 in the area. The figure is close to the National range in the United States which is $53,210 – $180,000 at an average of $68,000. The cardiac sonographer top earners are experienced professionals who have the skills, education, and reputation on the job. Other factors that affect earnings include employer , location among other things. Some have argued that cardiac sonographer’s salary may not be that high and the fraction of the top earners is actually small. The location of the Cardiac sonographer and the employer greatly influences the amount received, though not all professionals are in the top tier earning level. Cardiac sonographers, or echocardiographers, are medical professionals who assist doctors in treating and diagnosing cardiac (heart) problems. The Cardiac Sonographer salary is at an average of $68,000, earnings are influenced by location, employer, level of education, skills and reputation. Other factors to consider include perks, bonuses, allowances and overtime payment that may add up to the final figure. According to the U.S. Bureau of Labor Statistics (BLS), cardiovascular technologists and technicians were predicted to see increased employment opportunities. The figure is estimated to be around 29 percent between 2010 and 2020. With more universities, colleges and professional schools, physician offices and outpatient care centers in need cardiac sonographer’s. The cardiac sonographer’s job is specialized and they work in conjuction with cardiologist and other physicians and nurses. Some of their responsibilities can be found below. The cardiac sonographer use devices such as echocardiograms and ultrasound treatments to study patients’ heart chambers, valves and blood vessels. The images help cardiologists or heart doctors diagnose heart disease, enlarged hearts or blockage in their patients. Sonographers should also possess mechanical aptitude, good communication skills and the ability to help patients relax and be comfortable during procedures. They may also perform Holter monitoring and stress testing. They are responsible for preparing patients, taking medical histories, maintaining equipment and performing procedures. The produced images help them determine blood pressure, blood flow, circulation and oxygen saturation. Physicians then use this information to diagnose disorders that affect circulation. To became a cardiac sonographer may be trained to have a 2 years associate degree in nursing, health science courses or natural science. To increase the chance of employment and marketability, they can also obtain a bachelors degree in sonography. An option of a year certificate course is also available for prospective students, who have experience or work in the health. Their curricula usually consist of classroom, laboratory and technical training on echocardiograms, for example. Courses often include physiology, ultrasound physics and cardiac principles. There are a number of certification courses available for cardiac sonographer’s this is usually done after the initial approved educational training. After graduation, they usually train for a year before getting certified through either Cardiovascular Credentialing International or the Society of Medical Sonography. ARDMS (American Registry of Diagnostic Medical Sonographers) administers examinations and awards credentials including the areas of diagnosticical sonography, diagnostic cardiac sonography and vascular technology. The bachelor degree holders get a cardiac sonographer salary higher than most of their peers.